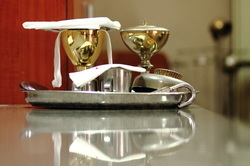 The Holy Mass is a powerful way to offer Thanksgiving, Prayer and intercession for ourselves and on behalf of others. Book a Mass for a loved one or event here. Congratulations on your decision to marry. Matrimony is a Sacrament; you are required to attend our classes to better understand and appreciate it. Baptism makes us all Christians and Children of God. Baptism occurs every Second Saturday of the month at Saint Leo's preceded by instruction classes.